Edgar Modern's final major solo show of the year will feature paintings from the leading contemporary painter Carl Melegari. Silent Expression will celebrate Melegari's exploration of the figure at the height of his skill and accomplishment. His work is recognisable by its muted pallette and the sculptural application of paint, scraped back then reapplied in luscious swathes. Melegari's masterful painterly style succeeds in creating work that loudly teems with movement, whilst presenting figures engaging in quiet contemplative moments. The deeply psychological atmosphere of his work, brooding and fearless, mesmerises the viewer. Melegari has described his ouvre as the portrayal of a subject âwho looks to be searching for his or her soul.' Carl Melegari was born in 1959 in North Wales of Italian parentage. In 1981 he graduated with a degree in Illustration in Bristol, where he currently lives and paints. His work draws from sculptural influences, such as Manuel Neri as well as from colourists, such as Morandi. 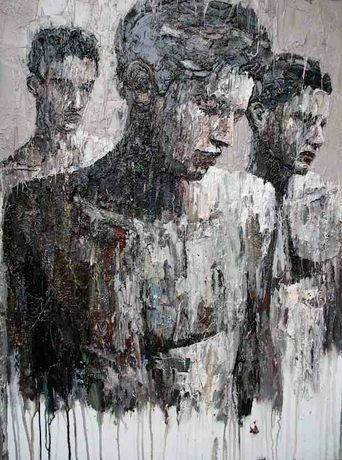 Edgar Modern is excited to present this exclusive new collection celebrating Melegari's masterful study of the human form.